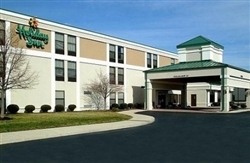 Holiday Inn Indianapolis Northeast Fishers, Hotel null. Limited Time Offer! The HolidayRead more Inn Indianapolis Northeast is a three star Business establishment has all the comforts such as : Restaurant, Room Service, Bar, Business Center, Laundry.This hotel is part of the Holiday Inn Hotels & Resorts chain.This hotel offers high speed internet.Take advantage of the gym which is available at the hotel.Other useful information:This hotel has a parking.